Welcome to the Kelvin TOP-SET Resources Area. Here you can find articles and papers on relevant topics and various incident investigation resources, all of which have been specifically designed to help make your investigations more efficient and effective. These materials are designed to complement the development practices taught on the TOP-SET Investigation Courses. However, if you haven’t attended a course, please do not worry; they should work equally well to expand your existing knowledge and skills. Find out more about Kelvin TOP-SET Professional Incident Investigation Courses and why many of the world’s leading companies use the TOP-SET system. Should there be any other resources that you would like to see here, please contact us to let us know. The purpose of a report is to communicate. Your job, therefore, is to create a straight-forward piece of writing which, step by step, conveys to the readers clearly and unambiguously what happened, why and your recommendations. An investigation is pointless if you do not do this. Continue reading. Don’t rush into the interview. Make sure you have thought of questions you want to ask and what you need to know. But be flexible; be able to follow where the interviewee leads if it seems likely to yield information. Continue reading. Do not ‘go it alone’ if you can avoid it. Good investigation requires discussion and it is all too easy to agree with yourself! Different types of people see things from different perspectives and in investigation you want to make use of this. Continue reading. It is important that you do not rush into the analysis before really checking that you have done all you can to gather the information you need. Some individuals are more likely than others to go for closure, the solution, before all the investigating has been exhausted. Continue reading. Investigators often rush in immediately and do not give time to thinking through the best way forward: people to be involved in the team, timing of task, who to do what etc. Nothing is gained and much is lost by proceeding in a rushed or haphazard fashion. Continue reading. Nobody likes writing reports. Nobody really likes writing anything; this applies to professional writers as much (if not more) than to the rest of us who have to write to communicate, on top of our other responsibilities. Continue reading. Nothing is obvious. Most of your information comes from people. Never try to prove a hypothesis; try to disprove it. Continue reading. Causality is the admission that you are the source of your manifestations i.e. that things do not just ‘happen’ to you or in your environment. In other words, everything that you attract into your world is coming at you because of something you are projecting out into that world. Continue reading. Can we rely on Wikipedia to help us with Root Cause Analysis? Andrew Morton, Senior Tutor at Kelvin TOP-SET, explores the definition of Root Cause Analysis taken directly from Wikipedia. It is worth considering, because an appreciation of the errors made in the definition should strengthen our understanding of the fundamentals of RCA. Continue reading. Change and failure are fundamental to every incident. Without change(s) and failure(s) there would be NO incident. Every good investigator will be looking for both changes and failures, but as they do, they should keep in mind that all changes are not failures, and all failures are not changes! Continue reading. If you think safety is expensive, try having an accident. 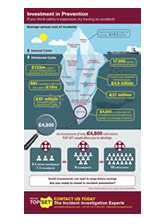 Kelvin TOP-SET Infographic about the real costs of accidents in the workplace. Click Infographic for larger view. Free Incident Report Form for you to download, share and use as you see fit to improve the recording of incidents in your organisation.